Let’s open with some relatively recent news, namely, that WestJet has begun talks with Boeing and Airbus to acquire wide-body aircraft. 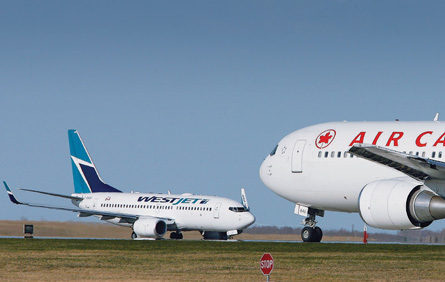 WestJet has begun talks with Boeing and Airbus about buying wide-body aircraft, suggesting it plans to go head-to-head with Air Canada on overseas routes. In Canada, a country where scheduled service is basically carved up by two major carriers, this is a big deal, and no doubt caught the attention of executives at rival Air Canada. No doubt it was intended to. The message: We’re coming. WestJet CEO Gregg Saretsky, who made the announcement in a presentation to investors and analysts on Dec. 6, did his best to hose down the drama component by stating the talks are of a preliminary nature only. Specific or not, the significance of the announcement will not be lost on Air Canada, because it more than suggests that WestJet is girding to battle its rival on the lucrative trans-ocean routes to Europe and Asia. This will be a significant change to the Canadian aviation landscape. And it will be a ballsy, and even a somewhat risky, decision internally for WestJet, which has built its brand offering service in North America using one type, and one type only, since its inception in 1996 – the venerable 737. It currently uses three versions of the type, the 600 (configured at 119 seats), the 700 (136 seats) and the 800 (166 seats). The devotion to the one-type model, and the cost savings utilizing just one type reaps, has played a significant role in the company’s remarkable success – 30 consecutive quarters of profit, many of those quarters defying the gravity of the worst recession in decades. Introducing other types will drastically complicate the training and certification of crew and maintenance personnel and the acquisition and storage of parts. Associated costs will be enormous. And yet, why not? The airline will be able to leverage its existing human and brick-and-mortar infrastructure, procedures, policies, government and stakeholder relationships, etc. So while the cost will be significant, the existing structure will make those costs far more manageable than if it were starting from scratch. In fairness to the news value, the notion of WestJet eventually acquiring wide-body airplanes was talked about openly by Saretsky himself back in December of 2011, when it announced plans to start a domestic regional airline (WestJet Encore). Encore is due to lift off in the second half of 2013. In fact, the regional itself, which will feature the Q400 product, was a break from the one-aircraft type model and there was concern among critics at the time of inception that breaking the one-type model was dangerous. But managed, calculated risk is what allows us all to get out of bed each morning. Same for a business. Even before the announcement of the Q400-based regional, airline had been flexing its wings vis-à-vis other aircraft types, using a leased Boeing 757 during the past few winters to augment its service to Hawaii. The experiment gave a window into the associated problems that another type would introduce and a safe platform from which to problem solve. Once the regional is up and running, the airline will have a seamless feed-in structure: A turboprop serving small communities and feeding a medium jet service serving North America, which in turn will funnel guests – WestJet doesn’t call them passengers – to points of departure for flights overseas. The logic is difficult to defy. Air Canada, the country’s dominant carrier, knows this is coming. It has already said it will lower fares on routes that WestJet begins to serve with the Q400 and on Dec. 18 rolled out its new discount carrier, Rouge, which will begin flying next July to Europe the Caribbean. Air Canada has gone the discount route before, and each time it collapsed under the weight of the airline’s existing structure. It’s worth noting that WestJet has a cost structure about one-third less than Air Canada’s, which is a large reason why it has thrived. The difference this time, and what makes Air Canada Rouge a more formidable adversary, is the arbitration decision imposed on pilots last summer that gave the airline the pay scale and flexibility it said it needed to compete. Watching the two heavyweight adversaries slug it out is like watching Ali-Foreman. More blows, of course, have to yet to land. Certainly where WestJet goes, one of the most highly anticipated will be its choice of wide-body product. Thoughts, anyone? This entry was posted in Airlines, Industry News & Commentary and tagged Air Canada, aircraft, airlines, Saretsky, WestJet, wide-body on December 18, 2012 by Craig Daniels.